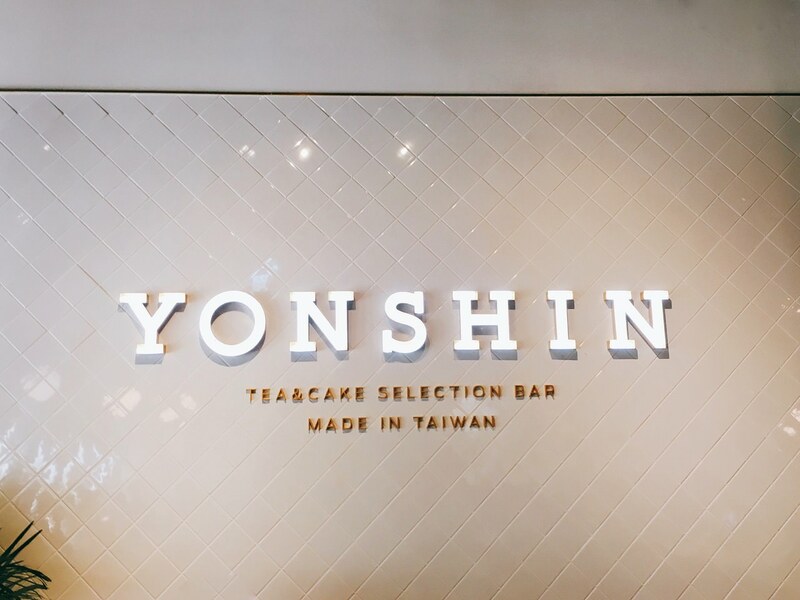 Yonshin Tea & Cake Selection Bar is one of the afternoon tea restaurants at Taipei Xinyi Breeze Department Store. 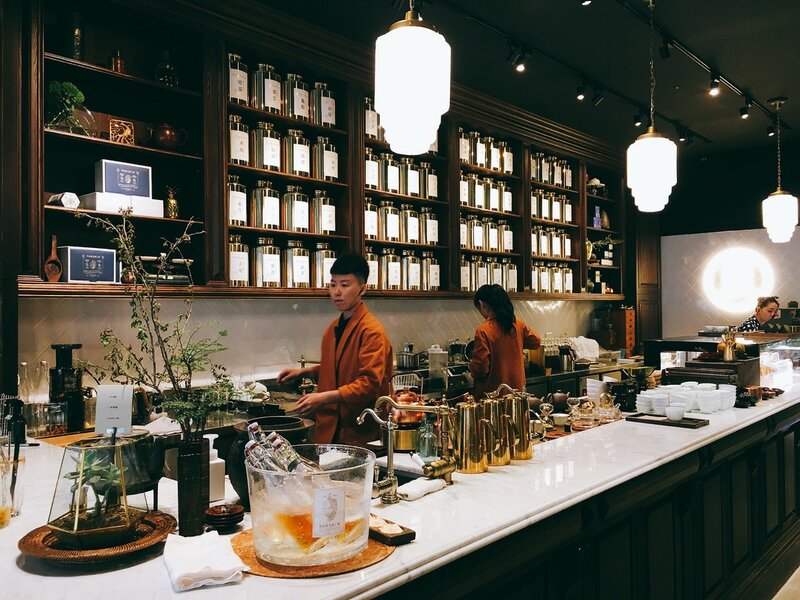 The cold-brewing tea with glass bottle is their signature tea. 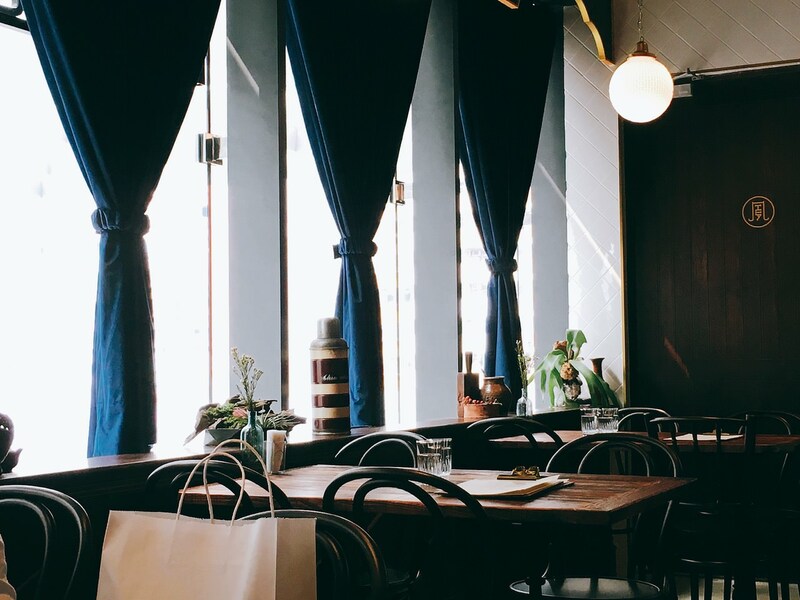 Its retro but yet modern interior design are its signature theme. 永心鳳茶以台茶沙龍理念點在信義微風3樓, 雖然在轉角處, 奢華金色招牌依舊相當亮眼, 茶葉罐整齊地擺設在櫃台後上方, 餐廳佔地相當大, 建議坐在靠窗區, 可看到 W Hotel 與信義誠品, 可惜的是座位稍微擁擠, 並沒有像民生社區的 “開門茶堂 “ 有安靜喝茶的感覺. 女店員身穿波卡圓點服裝, 男店員則是穿著西裝, 也有少數店員專門負責在櫃台煮茶, 概念跟 “瑪黑家居“一樣, 在客人面前顯現專業. 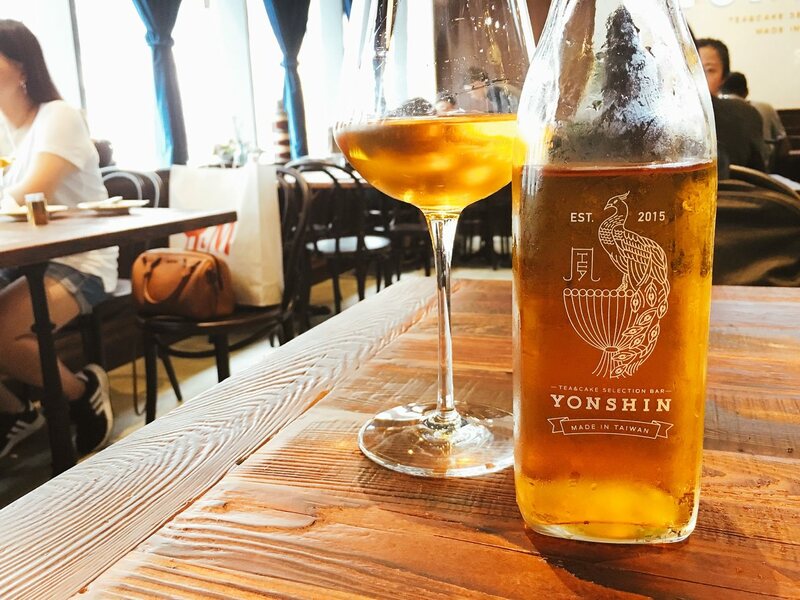 Yonshin Tea & Cake Selection Bar is located at 3F of Xinyi Breeze. Even though it is located at the corner, its bright golden sign is still very eye-catching. 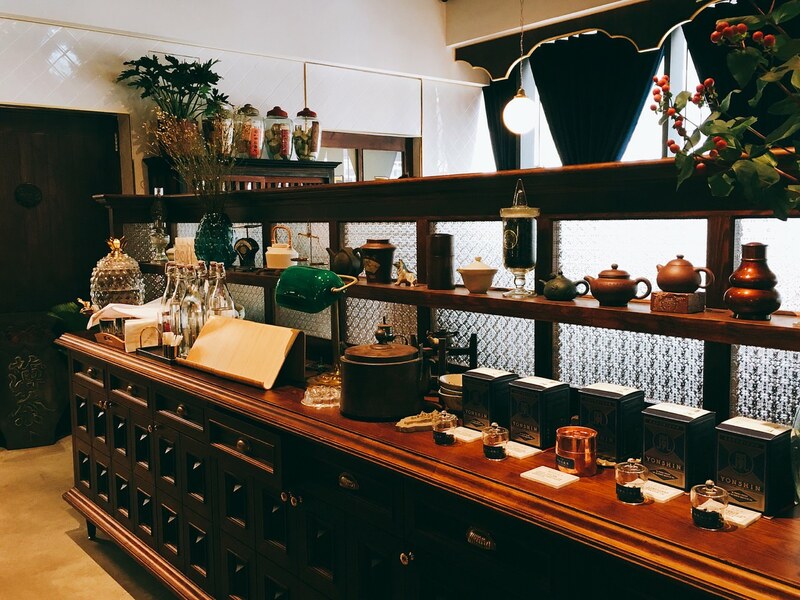 The tea containers are placed at the back of the counter. The restaurant is quite large. 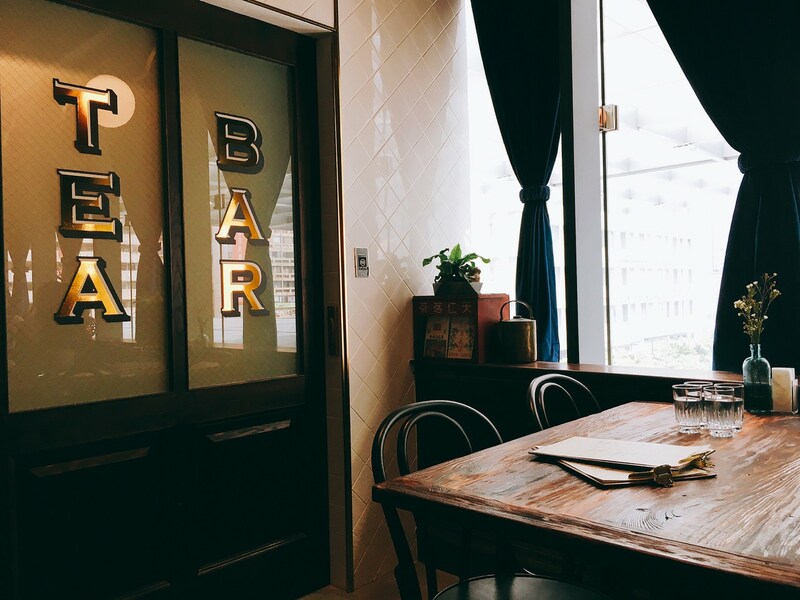 I would suggest to sit next to the window, so you can see the W Hotel and Eslite bookstore view. However, the seats are too crowded. 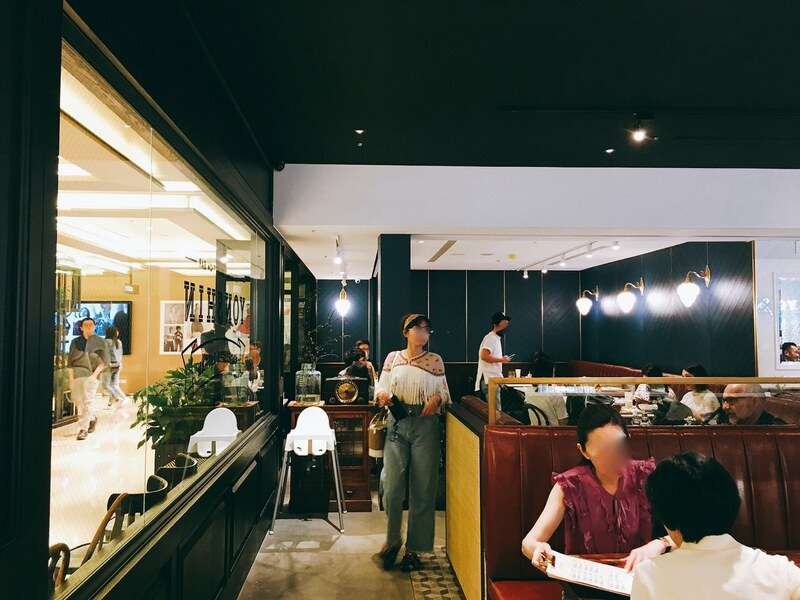 The customer wouldn’t have the drinking tea environment like “ Kaimen Tea House“ at Mingshen Community. Female staffs are dressed in polka dot dress. And male staffs are dressed in suits. 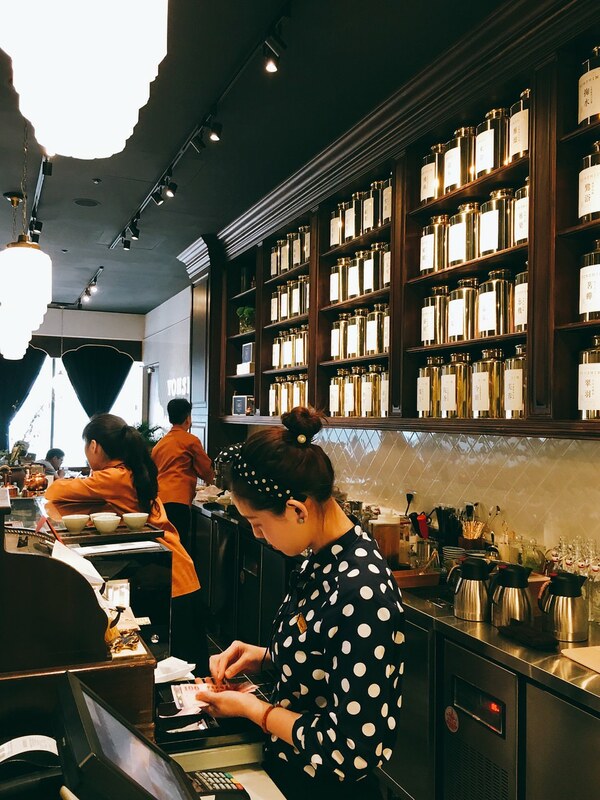 There are only a few professional tea brewing masters at the counter to brew tea, which is similar with “Marais Taipei”. 海拔 1000 公尺以上皆稱為台灣高山茶, 產區包括阿里山, 梨山…etc, 合歡山是其中一個產區. 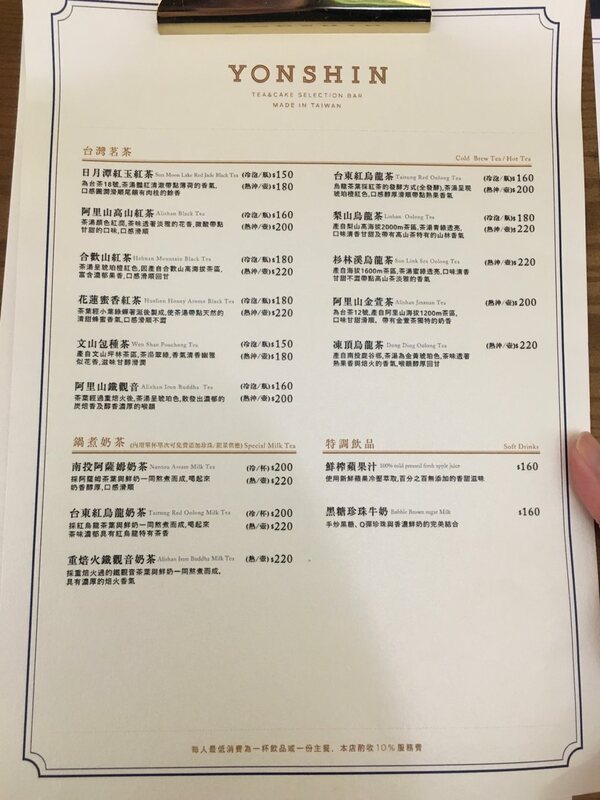 松菸文創的“十間茶屋”是用外帶小玻璃罐裝冷泡茶, 永心鳳茶的冷泡茶則是用大玻璃罐裝, 杯子是用高腳酒杯, 意味著品茶也可以跟品酒一樣時尚與專業. 透澈金黃茶湯如同晚霞, 倒入酒杯後, 建議跟品酒一樣先聞茶香, 清新花香令人期待, 高山茶亦柔亦剛, 此款合歡山紅茶是偏柔, 入喉完全沒有苦韻, 甘醇程度高, 整體表現相當不錯, 相當推薦這一款冷泡茶. The definition of Taiwanese High Mountain Tea basically means the tea leaves are grown above 1000 meter altitude. The tea areas include Alishan and other high mountains, including Hehuan Mountain. 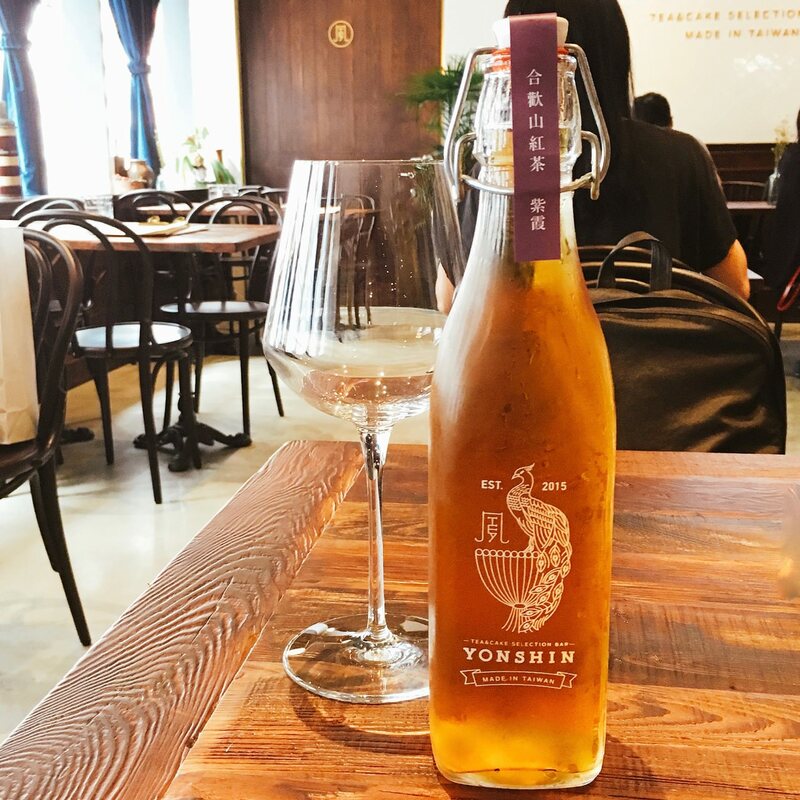 Yonshin Tea & Cake Selection Bar offers glass bottle of cold-brewing tea, which is different package method at “SHIJIAN Tea House”. 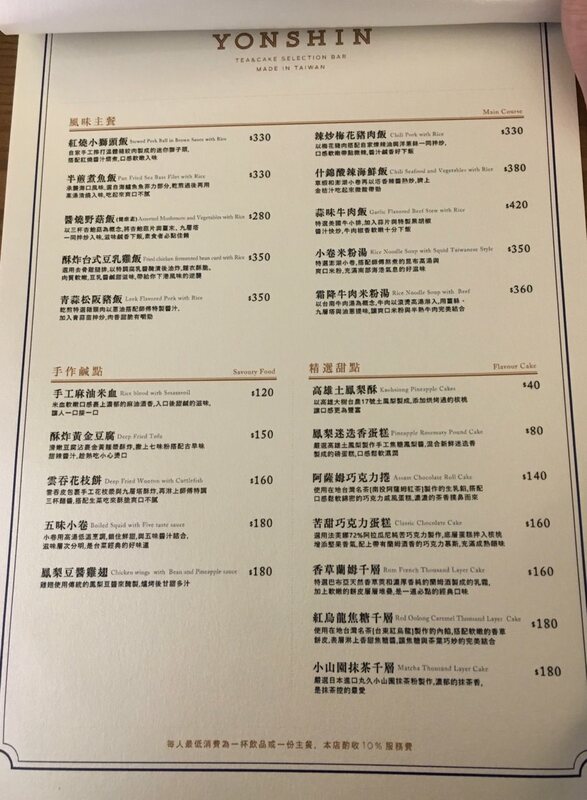 The restaurant offers tall wine glass as its specific drinking glass. 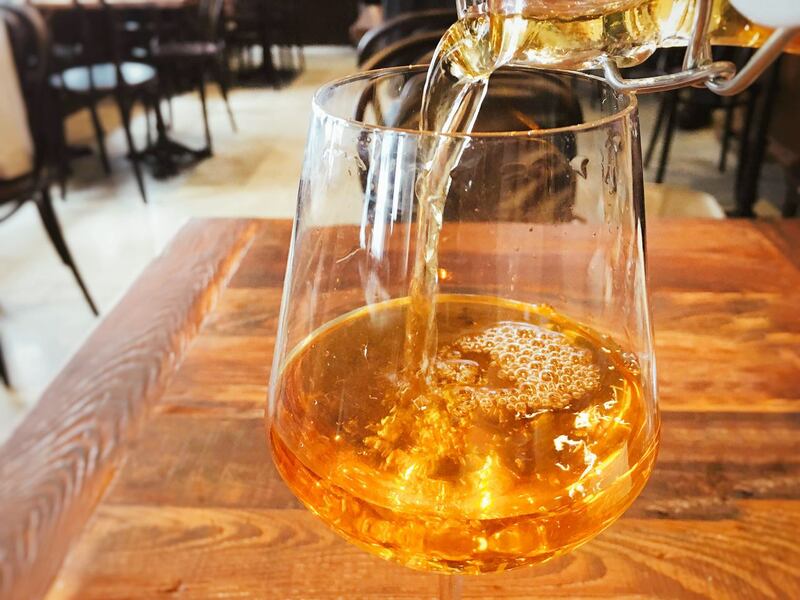 The golden color tea body is transparent. The floral aroma is unique and refreshing. It isn’t bitter at all. Instead, it is a bit sweeter and smooth than expected. I would definitely recommend this tea item. 紅烏龍焦糖千層是永心鳳茶的招牌甜點, 因為當天缺貨, 於是點了阿薩姆巧克力捲. 首先這不是生乳捲, 只是普通巧克力捲, 單吃其內餡有濃郁紅茶風味, 蛋糕體濕潤並不會乾, 巧克力風味相當濃郁, 但是兩種風味搭配在一起, 就跟 “富錦樹咖啡”的鐵觀音提拉米蘇一樣, 巧克力蓋住茶的獨特風味. 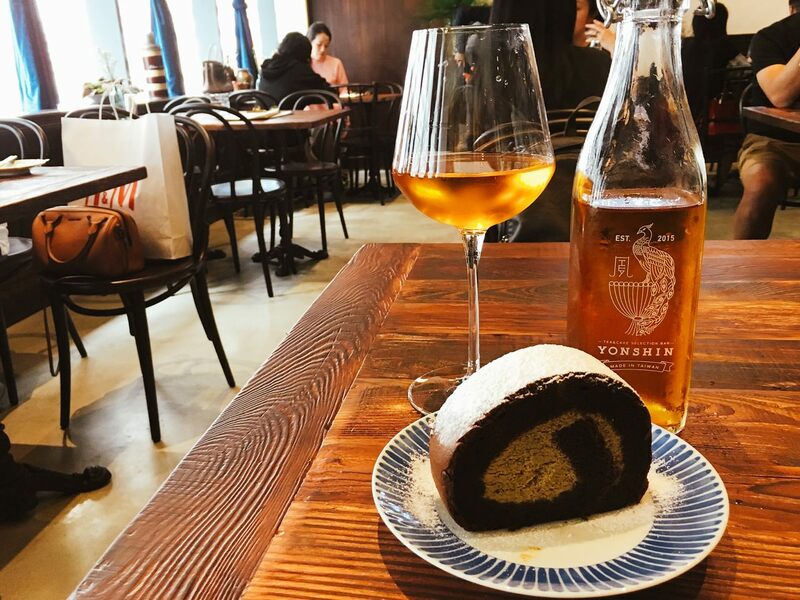 Red Oolong Caramel Thousand Layer Cake is their signature dessert. However, they didn’t have this dessert that day. 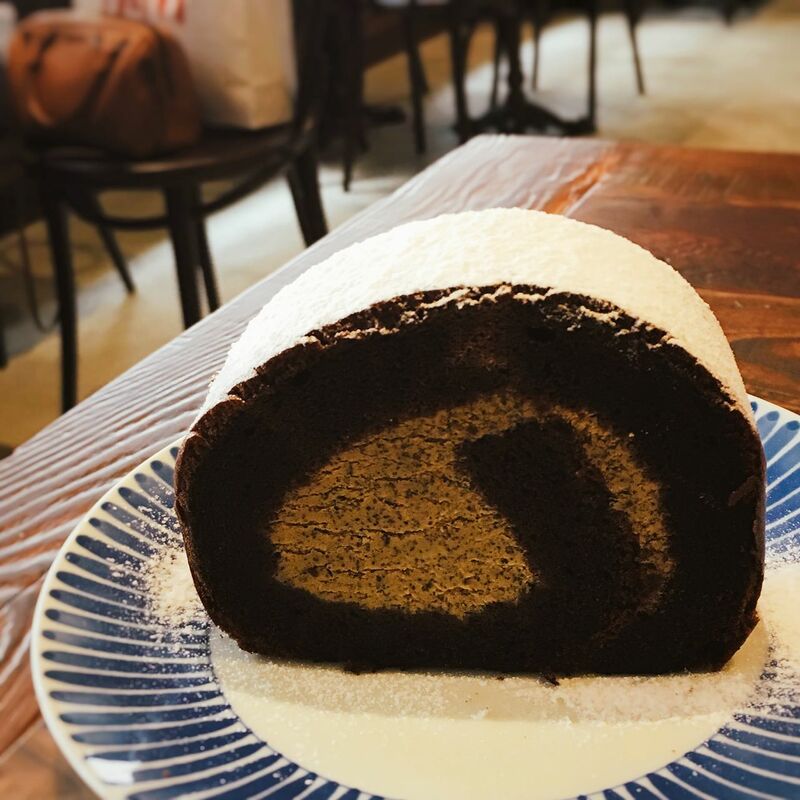 Therefore, I ordered Assam Black Tea Chocolate Cake Roll. It is a regular cake roll. But, its filling is full of black tea flavor. The cake body is moist, which is good. The chocolate flavor is stronger than expected. When two strong flavors mixed together, chocolate flavor covers the black tea flavor. The situation is similar with “Fujin Tree Landmark”’s Tienguanyi tiramisu.